Chicken marinated in Vinegar and cooked on slow heat with a hint of bbq. 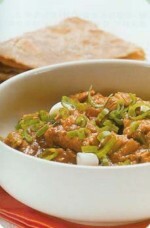 Boneless Chicken chunks simmered in a tomato puree with a hint of spices and aroma of fresh cilantro and green chillies. 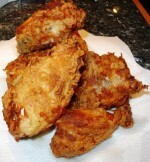 Broasted chicken is as tasty as other fried chicken. Simple enough for every day and elegant enough to serve in parties. Korma, a classic Non-vegetarian Dish is cooked in yougurt gravy. The flavor of this dish is further enhanced by using Mint and Cilantro and squeezing a dash of lime just before serving. Korma is a great accompaniment with Steamed Rice or naan. Chicken cooked in a tasty tomatoes and yogurt curry.